Our personal trainers and coaches are in the business of changing and saving lives. Whether you need a lifestyle change recommended by a physician, need accountability and instruction to ensure you’re getting your workouts in, or if you want to take your current fitness to the next level, our trainers are here to help! 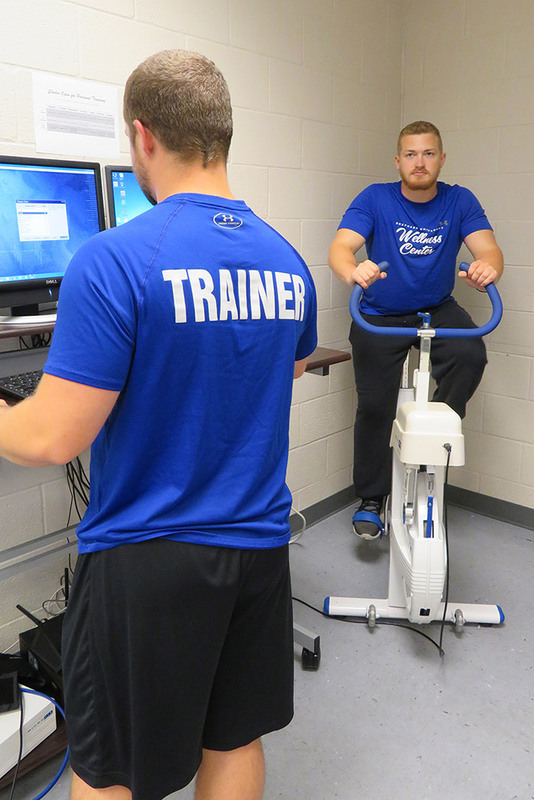 All of our personal trainers and coaches hold a degree in exercise science or another health-related field and are certified through a nationally accredited organization. Learn more about our trainers here. Get started with a personalized FITT Kit! What is a FITT KIT? Knowing where to begin your fitness journey can be overwhelming. The FITT Kit Offers a solution to provide you clearer direction and confidence as you work towards your fitness goals. This sixty-minute session will provide greater insight on your current fitness, as well as offer recommendations for improving your fitness based off of your goals and a comprehensive wellness assessment. The wellness assessment will be customized to measure health and fitness markers specific to you. Sign-up at our front desk or at one of our FITT Kit boxes around our facility. If using the FITT Kit box, place the slip in the box, and a trainer will contact you within seven calendar days to schedule your session. All FITT Kit participants must print off (or pick up at our front desk) the personal training packet which includes documents such as the Physical Activity Readiness Questionnaire (PAR-Q), Exercise History, and Physician’s Release. The packet should be completed before your appointment. Will you need a physician’s approval prior to participating in the FITT Kit? Any person’s requiring a physician’s approval, will need to provide the appropriate documentation before participating in assessments or prescribed exercise. Drink plenty of fluids during the 24-hour period before your testing. Refrain from eating, smoking and drinking alcohol or caffeine for 3 hours prior to testing. Do not engage in strenuous activity the day of our session. Get adequate sleep (6-8 hours) the night before we meet. Please come dressed in workout attire (full sleeve t-shirt, pants/shorts and sneakers). If interested in a posture assessment, please wear form-fitting clothes or a tank top and shorts. Already working with a trainer or coach? Working with a personal trainer will provide you with the edge to ensure you achieve progress in your goals. Your personal trainer will use information from your FITT Kit to first map out a plan to achieve the desired results to excel your fitness and improve your overall health. Within your sessions, your trainer will educate, assist, encourage, and progress you through safe and effective workouts. 30 minute sessions can be combined for a longer workout per client/trainer agreement. *12 and 24 package assessments include an additional FITT Kit for reassessment at the completion of all sessions. Download our Personal Training Packet. By involving a partner in your sessions, whether it is a family member or close friend, you will both benefit from a new element of accountability and fun in your training. As you and your workout buddy share in the experience (and also enjoy the reduced cost), you will be pleased in the progress you each make towards your shared goals. Are you an athlete looking to sharpen your skills and gain a competitive edge in your sport? Your trainer will work with you on sport-specific training to improve your athleticism. Unlike your general practice, in your sessions will specifically be designed in the areas you seek improvement with cueing and progressions appropriate to advance YOU to the next level. *6 and 12 package assessments include an additional FITT Kit for reassessment at the completion of all sessions. The Wellness Center also provides small group and team performance training. Please contact the Wellness Center Director directly at jsweeney@shepherd.edu for pricing and programming. Download our Athletic Performance Training Packet. Individualize Your Yoga Experience! Reach your goals or perfect your pose with one-on-one private yoga instruction. Private Yoga packages include a complimentary assessment, tailored program, and one-on-one instruction in a private room in the Wellness Center. Questions? Email Jim Sweeney at jsweeney@shepherd.edu. Download our Private Yoga Package.